The software RP Fiber Power can be used for analyzing and optimizing setups for supercontinuum generation. As an example, see a case study. Various diagrams of the article have also been made with that software. 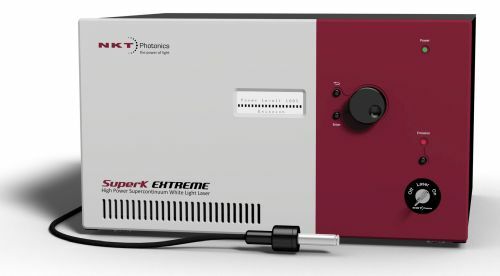 Supercontinuum generation is a process where laser light is converted to light with a very broad spectral bandwidth (i.e., low temporal coherence), i.e., a super-wide continuous optical spectrum. This means that the temporal coherence is very low (but with important restrictions – see below! ), whereas the spatial coherence usually remains high. The spectral broadening is usually accomplished by propagating optical pulses through a strongly nonlinear device. For example, one may send an intense (amplified) ultrashort pulse through a piece of bulk glass. 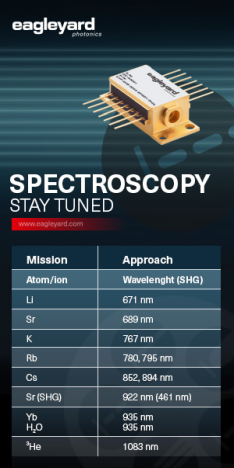 Alternatively, one can send pulses with much lower pulse energy through an optical fiber, having a much higher nonlinearity and also a waveguide structure which ensures a high beam quality. Of special interest are photonic crystal fibers, mainly due to their unusual chromatic dispersion characteristics, which can allow a strong nonlinear interaction over a significant length of fiber. 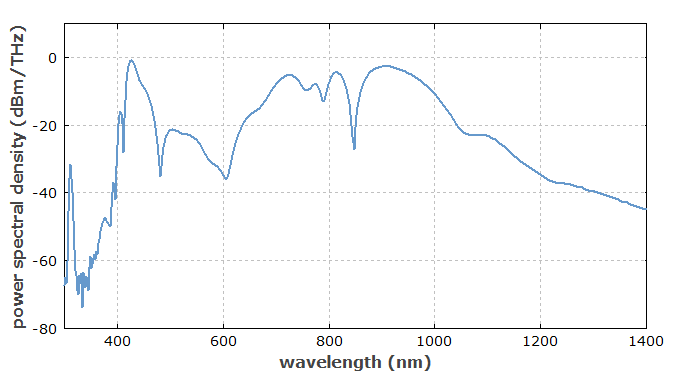 Even with fairly moderate input powers, very broad spectra are achieved; this leads to a kind of “laser rainbow”. In some cases, tapered fibers are used, which provide a very strong nonlinear interaction over a short length. Figures 1 and 2 show numerically simulated results for supercontinuum generation in a very short piece of fiber. In many cases, however, much longer fibers are used – then usually in conjunction with much lower peak powers. 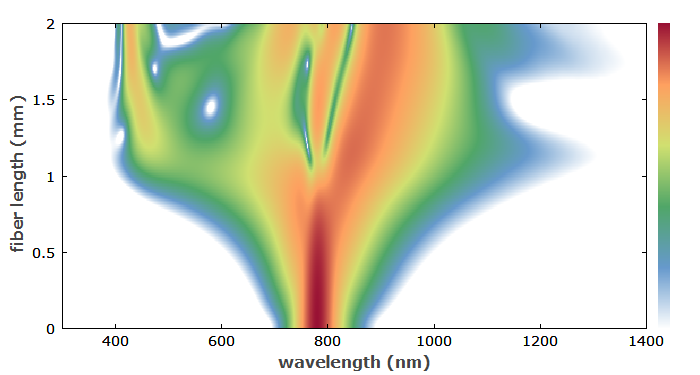 Figure 1: Numerically simulated supercontinuum, assuming that 20-fs laser pulses propagate through a 2-mm long photonic crystal fiber. The time domain (upper graph) exhibits a complicated multi-peak structure, whereas the optical spectrum (lower graph, with logarithmic scale) has a significant power spectral density over more than one optical octave. The simulation took into account chromatic dispersion, the Kerr nonlinearity (leading to self-phase modulation and four-wave mixing) with self-steepening, and Raman scattering. Such simulations can be done with the RP Fiber Power software. Figure 2: Evolution of the optical spectrum along the fiber (vertical axis). After ≈ 1 mm propagation distance, further spectral broadening is weak because the peak power has decreased a lot. Note that the intensity color scale (bar on the right-hand side) is logarithmic, spanning a 40-dB range. Applications of supercontinua include optical coherence tomography, fluorescence microscopy, flow cytometry, the characterization of optical devices, the generation of multiple carrier waves in optical fiber communications systems, and the measurement of the carrier–envelope offset frequency of frequency combs. Figure 3: The white-light output of a high-power supercontinuum source is spatially dispersed by a diffraction grating in order to demonstrate the spectral content. The beam path has been made visible with a fog machine. The photograph has been kindly provided by NKT Photonics. The physical processes behind supercontinuum generation in fibers can be very different, depending particularly on the chromatic dispersion and length of the fiber (or other nonlinear medium), the pulse duration, the initial peak power and the pump wavelength. 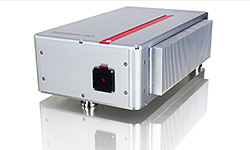 When femtosecond pulses are used, the spectral broadening can be dominantly caused by self-phase modulation. In the anomalous dispersion regime, the combination of self-phase modulation and dispersion can lead to complicated soliton dynamics, including the split-up of higher-order solitons into multiple fundamental solitons (soliton fission). For pumping with picosecond or nanosecond pulses, Raman scattering and four-wave mixing can be important. 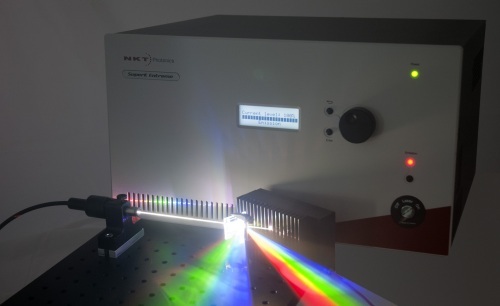 Supercontinuum generation is even possible with continuous-wave beams, when using multi-watt laser beams in long fibers; Raman scattering and four-wave mixing are very important in that regime. The noise properties of the generated continua can also be very different in different parameter regions. In some cases, e.g. with self-phase modulation being the dominant mechanism and the dispersion being normal, the process is very deterministic, and the phase coherence of the generated supercontinuum pulses can be very high, even under conditions of strong spectral broadening. In other cases (e.g. involving higher-order soliton effects), the process can be extremely sensitive to the slightest fluctuations (including quantum noise) e.g. in the input pulses, so that the properties of the spectrally broadened pulses vary substantially from pulse to pulse. The strongly nonlinear nature of supercontinuum generation makes it difficult to understand intuitively all the details of the interaction, or to predict relations with analytical tools. Therefore, numerical pulse propagation modeling (often with special precautions due to the extreme optical bandwidth) is required for the analysis of such processes. Intuitive pictures or analytical guidelines can be tested by comparison with results from such numerical models. It is worth spending some thoughts on the coherence properties of supercontinua. The spatial coherence (considering the cross-spectral density) is usually very high, particularly when the source involves a single-mode fiber. On the other hand, the high spectral bandwidth suggests a very low temporal coherence. However, supercontinua generated from periodic pulse trains can still have a high temporal coherence in the sense that there can be strong correlations between the electric fields corresponding to different pulses, if the spectral broadening mechanism is highly reproducible. This kind of coherence is in fact very important for the generation of frequency combs in photonic crystal fibers, and it may or may not be achieved depending on parameters such as the seed pulse duration and energy, fiber length, and fiber dispersion. The initially surprising discrepancy between high bandwidth and high temporal coherence can be resolved by realizing the shape of the field correlation function: it has a very narrow peak around zero time delay (with a width of e.g. 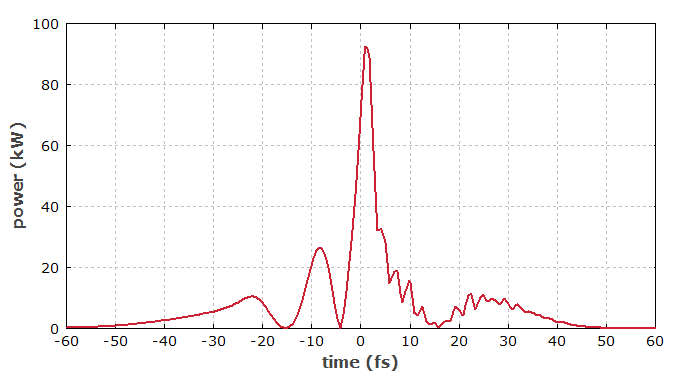 a few femtoseconds), but there are also additional peaks with comparable height at time delays corresponding to integer multiples of the pulse period. Hence there is low temporal coherence in the sense of vanishing correlations for most time delays, but high temporal coherence in the sense of strong correlations for some large time delays.